Dear ladies, friends of Songbird and readers of this blog. This is mr. Songbird speaking. I took over the blog for a day, it was necessary…. You may or may not know that I have invoked a veto for appearing on this blog. That lady of mine is never without a camera and therefore she ‘catches’ me doing this or that frequently, (often she catches me in the act of taking a power nap…..) and I do not want to be exposed to this world wide audience of her. Consequence of her always logging that camera around is that I have never had any reason to take any pictures myself. Which of course resulted in her complaining that I never took a photograph of her. Well I got her now. I recently bought myself a nifty little ‘guy-camera’ and I am in the process of learning how to handle it. So when I recently took my gal to a day out on the town in honor of her birthday I was the man in charge of taking the pictures. I thought it was only fair that I showed off those pictures myself here. 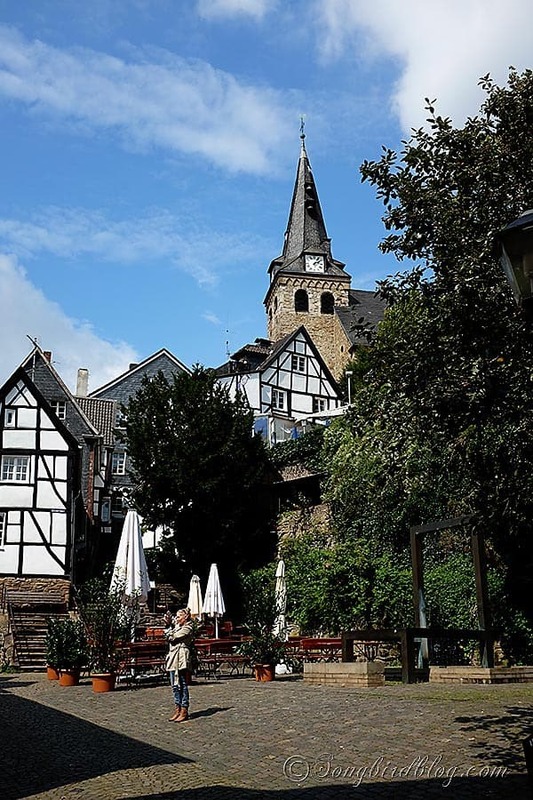 So please come along as I show you the medieval town of Kettwig in Germany. I’ll be brief in my commentary, since typing up this little essay in English already took me an hour. “Slates that formed intricate patterns”. “My gal saw photo opportunities everywhere”. “Oops she is fed up with my paparazzo stuff. ‘Are you done yet?’ Sure honey but don’t you ever complain again that I don’t take your picture”. “Well, this is it. Saying goodbye now. Hope you enjoyed my tour of Kettwig and coming along with me and my lady. It was fun hanging out on the blog for a change, but I don’t think I am going to make it a habit. Blogging is better left to my woman. This is me again. Leave your laptop open for a moment and your blog is hijacked. He did a good job, didn’t he ladies? But I am not sure I want this many photos of myself appearing in a post…..
Ah, leaving your laptop open means all bets are off. Lovely town, I would have snapped that door, also. What beautiful architecture. Now that he has a camera, I foresee dueling pictures. How lucky to have a man who will go into a “girly” shop. Mine would never even go shopping with me for ANYTHING. I am lucky for sure. In more ways than one. My man loves to shop, he has more clothes shopping stamina than I do. Love it! I love the things he noticed compared to waht you usually point out. So fun. Great to hear from you Mr. Songbird. You’ve shared a very interesting day out. Thanks for all the photos showing the area you visited and the things you saw, not to mention the lovely lady with whom you saw it! No… he did a GREAT job! Bravo Mr. Songbird!! Ah loved it! But one reason I love your posts is that you’re always opening my eyes to new experiences…beauty in this town’s door. I thought, yes…that is an unusual door–but especially with the Xs in dark framing above to make this frilly door stand out more! The church! The tiles. Would I have noticed the patterns without the comment by the Mr? You teach us crafts, visions of beauty in Europe, a beaut of a new bike and the heartbreak of a small country. The joy of royalty. And their parade. Intricate crotchet to our flea markets piled in heaps and your country’s so lined up like little children, in straight rows, after a hard time of recess play. I’ve laughed. Cried. Smiled. Giggled. Copied. And enjoy this blog for it is always a surprise treat. HAHA! Adored this entry! Yes, let’s have Mr. Songbird back again… that way we also get to see more of you! 🙂 Lovely photos!